Very exciting news this. There is going to be a (an?) Hacktionlab this winter once more. 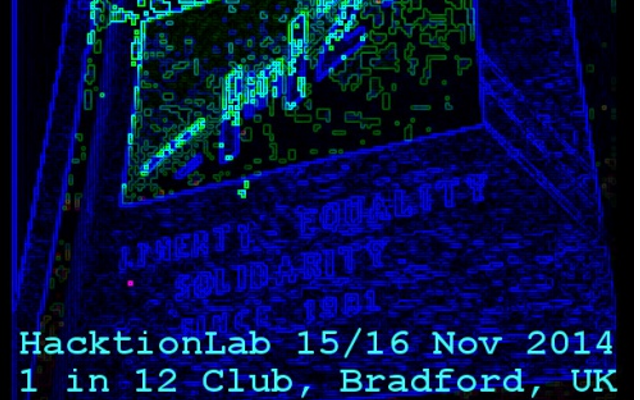 As often happens the event will be held at Bradford’s 1 in 12 Club — one of the longest running Anarchist social spaces in the UK. This year we will all no doubt raise a glass to our fallen comrade Protag between hacking sessions. The agenda is being developed collaboratively over on the Winter 2014 hacktionlab wiki. Already slated are sessions on privacy; working on the 1 in 12 website; and planning for a 2015 Barncamp.